Forty years after it was recorded, Jimi Hendrix's previously unreleased Valleys of Neptune will be included on a 12-song CD of the same name. The set will be issued on 9 March. Centered around tracks recorded during a pivotal and turbulent four-month period in 1969, the album Valleys Of Neptune offers the original Jimi Hendrix Experience's final studio recordings, as the group lays down the foundation for its follow-up to Electric Ladyland, alongside the guitar hero's first sessions with bassist Billy Cox, an old army friend Hendrix recruited for his new ensemble, Band Of Gypsys. Valleys Of Neptune provides a compelling and up-till-now largely unseen view of what Jimi Hendrix was up to musically in the critical period between the release of Electric Ladyland in October 1968 and the 1970 opening of his own Electric Lady Studios in Greenwich Village, the state-of-the-art facility where he would begin his final project, the ambitious double album First Rays Of The New Rising Sun. 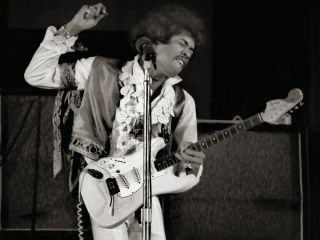 Hendrix was "at home in the studio"
Janie Hendrix, CEO of Experience Hendrix LLC, the Hendrix family-owned company entrusted with preserving and protecting the legacy of Jimi Hendrix, noted, "My brother Jimi was at home in the studio. Valleys Of Neptune offers deep insight into his mastery of the recording process and demonstrates the fact that he was as unparalleled a recording innovator as he was a guitarist. His brilliance shines through on every one of these precious tracks." Produced by Janie Hendrix, John McDermott, (who contributes detailed liner notes to the album) and Eddie Kramer (Hendrix's longtime engineer, who first worked with the guitarist on 1967's Are You Experienced? ), the centerpiece of Valleys Of Neptune is the much sought-after title track, which will be released as a single on 2 February. Other highlights on Valleys Of Neptune include blazing studio covers of Elmore James' classic Bleeding Heart and Cream's Sunshine Of Your Love, as well as premier performances of original Hendrix compositions like Ships Passing Through The Night, Lullaby For The Summer and the original un-dubbed Jimi Hendrix Experience rendition of Hear My Train A Comin'. "It's wonderfully fresh material," Eddie Kramer told USA Today. "You hear the pure essence of the band, an in-your-face vibrancy. There were only four tracks and no overdubs, with Jimi singing as if he's in a concert. He's at the top of his game."